Jim McIntyre says his Ross County side and Kilmarnock would not play out a draw in the final game of the season if it saved both from relegation trouble. And Kilmarnock pair Josh Magennis and Mark Connolly agree that it is not something they would countenance. 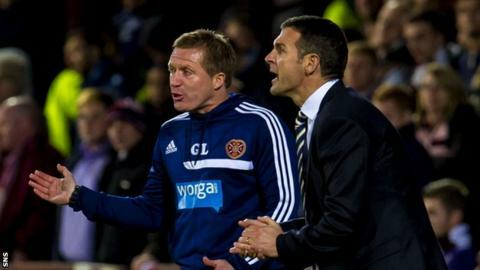 Depending on the weekend's results, Motherwell could be consigned to the relegation play-off spot should County finish level with Gary Locke's team. "I've never set out a team for a draw," manager McIntyre told BBC Scotland. "We set up every game to try to win it and, as professional people, both myself and Gary will be trying to win." Motherwell, who visit relegated St Mirren on Saturday before hosting Partick Thistle, are three points behind County and Locke's Kilmarnock. Depending on how County fare at home to Hamilton Academical and Kilmarnock's result away to Thistle, three clubs could go into the final day still in danger of finishing second bottom. West Germany and Austria famously fought out a result that ensured both progressed in the 1982 World Cup at the expense of Algeria. Dismissing such comparisons, McIntyre said: "I'm not going to have that labelled at my team. "It is easy for people to start making assumptions about what will happen, but football can change in the blink of an eye - players getting sent off, goalkeepers making mistakes. "To try to set up for the draw is very difficult. If you sit back off the game, you can find yourself being put under a lot of pressure." County lost at home to St Mirren on Saturday and, since a nine-game unbeaten run came to an end, have now not won in their last three outings. For Killie striker Magennis, the notion that his team would not be going all out to win a match on the final day of the campaign seems far-fetched. The Northern Irishman told BBC Scotland: "As a professional, you don't want to be remembered as the team that stayed up by playing a 10 v 10 possession. "At this club we are taught to win and that's what we try to do at all costs. "For me as a striker, I want to score goals so that (playing for a draw) is not even in the back of our thoughts. We are out to win every game." His remarks were echoed by team-mate Connolly, the defender adding: "I don't think that would be a very exciting game. "We are going out to win our two games and that would be us safe. "We can't look past the Partick Thistle game. We have to do what we can do and our objective is to beat Partick on Saturday and then take it from there. "We could be safe, we might not be."